Why would you make a PC the size of a postage stamp? Because there are so many places to stick it that ARM has had to itself. There are plenty of processors to use in wearable devices and the tiny new devices that will make up the Internet of Things. Most of them come from ARM, with embedded controllers based on older architectures like MIPS tending to show up in larger devices like network video cameras or set-top boxes. If you want a processor small enough to fit in a cable or a razor, you'd use an ARM chip; Schick uses an ARM chip to control the motor that makes its razors vibrate at the right frequency to make your hairs stand on end so you get a cleaner shave. By contrast, the tiny PC featuring its Mullins processor AMD showed at CES this year was the size of a smartphone, about the same size as the Galileo PC board Intel had for developers last year. In the past we've seen PCs that would fit in a matchbox, or about the same size as a Raspberry Pi. 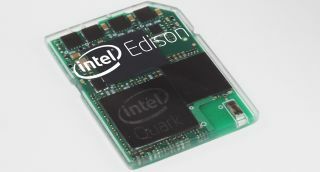 Edison, developed in Intel's Beijing research labs, is far smaller. The whole PC is the size of an SD card; the low power DDR2 memory is stacked on top of the 22nm CPU (that's the Quark SoC), the Wi-Fi and Bluetooth LE radios are next to it with the flash storage, and when you flip it over it has the same SDIO connector as any other SD card so you can put it in a PC to program it. It also has a SIM connection so you can get data to and from an Edison device that way too, and it has pins for the standard low-power buses used in many devices (GPIO, UART, I2C, SPI and PWM). What you get is a dual-core processor that Intel calls Pentium class; we'd call it sub-Atom (in fact the Quark name might be a joking reference to that, as quarks are sub-atomic particles). The low-power core runs an Intel real-time OS that can handle the basics of keeping a device running, the other runs Linux – and Intel already has software from Mathematica that can run on that. That was probably much easier to get onto Edison because, underneath, it's a familiar PC. The beauty of Edison is that Linux developers who are used to writing code for PCs get a very familiar programming model, which will simplify writing drivers for all the sensors you might want to build into a wearable device as well as opening up hardware development to developers who don't have experience with real-time systems (which are usually much harder to work with than more forgiving x86 code). But they also get the low power you expect from an embedded processor. "It uses 1W when it's on," Randy Wang from Intel Labs China told us, "but it's under 250 mW if you only have the small core running to keep it alive." So when just the sensors are active, the power use is low; when they sense something you want the device to react to, the Linux core wakes up and does the work. In the future, he promised, "it will go a lot lower". He's bullish about Edison compared to other options. "The others that are as small don't have the same capability, in terms of DRAM and CPU. The others that can do as much are bigger or run hotter." The team has big plans for adding more features to Edison. It doesn't have hardware codecs like H.264 today (which saves a lot of power for video playback) but they'll come in time, Wang told us. The plan was to get the first model out quickly and then start adding extras – and shrinking the device. "In the next couple of years we will integrate the radio more. The storage can become phase change memory in the SoC, which also acts as DRAM. In a number of years, this will just be a single chip. And in a few years the SD size will be micro SD." That means the baby monitor that Rest Devices showed at CES won't have to double as a baby toy in case the child pulls it off their onesie and starts sucking on it; it can be small enough to be sewn into the label (although you might not want to wash it) and easily small enough to fit into the coffee cup that changes colour to show you if your child is running a fever. Of course ARM chips and the rest will be getting smaller as well, but at that size, Intel has a shot at taking a share in the Internet of Things.